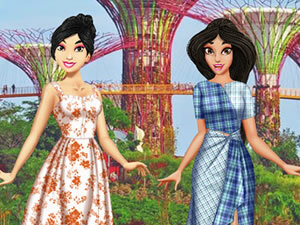 Get the Crazy Rich Asian Princesses game for girls started and begin dealing with your tasks as you help the two girls prepare for the party of the year. They both want to dress to impress so make use of all those designer clothes and mind-blowing jewelries in their wardrobe to make them look jaw-dropping once again. Begin by styling up their hair, do their make up looks and then go crazy with their party outfits. Choose your favorite dress for each of them, then pair your selection with killer heels, animal print coats and unique accessories. Have a great time!